Reconditioned Stuart Turner Replacement Pumps. Is your Stuart Turner/Monsoon or Grundfos negative head or positive head shower pump on the blink? Do you need to replace your existing shower pump? If you do, before you decide on replacing it with a new one, why not consider replacing it with a reconditioned shower pump? Regardless of whether you currently use a Stuart Turner/Monsoon pump, a Grundfos pump or any other make of pump that pumps water to your bathroom or kitchen, if you need to replace it, you have come to the right place. Right now, we are offering a great deal on both negative head and positive head replacement pumps. For a limited time, we can offer you a reconditioned 1.5 BAR Stuart Turner negative head shower pump supplied and fitted anywhere in Dublin 1 to 24 for the amazingly low price from only €550.00 plus VAT plus your old Stuart Turner negative head pump as a trade-in. We can also supply and fit a reconditioned Stuart Turner 1.5 BAR positive head pump for only €300.00 plus VAT with a trade-in ST positive head pump. Why Choose A Reconditioned Stuart Turner Shower Pump? 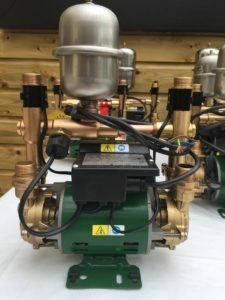 Reconditioned Stuart Turner positive head and negative head pumps are a fantastic alternative to buying an expensive new one, and here are some of the reasons why. They are have the cost of a new Stuart Turner pump but look and work equally as wel l as a brand new one. You have peace of mind as our reconditioned positive head and negative head house and apartment shower pumps come with a full 12 months parts and labour ‘onsite’ warranty. Our reconditioned pumps are stripped down, cleaned, polished and rebuilt using all new parts and NOT reconditioned or old parts. Our negative head and positive head house and apartment pumps look and perform like a brand new shower pump. There is no compromise on performance, durability or reliability. All our reconditioned Stuart Turner negative head and positive head shower pumps are fully tested before they leave our workshop ensuring they meet our high standards. If you would like to know more about our current fantastic offer or you would like to order a replacement shower pump for your house or apartment, please call us now on 01-823 2324 or 086 357 9495. Q: If my reconditioned pump breaks down during the 12 month warranty period, do I have to bring the pump back to you or do you send a repair technician to me? – A: We provide you with a 12 month “onsite” parts and labour warranty. This means you do not have to bring the pump back to us, we send our pump expert to you to fix the pump. Q: What’s the difference between an onsite warranty and a workshop/in-shop warranty? – A: An Onsite warranty, which is what we provide you with, means we send our pump repair technician to you in the very unlikely event the shower pump breaks down during the 12 month warranty period. Any faulty parts are replaced without charge during your 12 month warranty period. A Workshop/in-shop warranty, which is what other reconditioned pump suppliers provide you with, means you have to bring the pump back to them for repair if the pump should breakdown during the warranty period. A Workshop warranty adds significant extra costs to you. Although the pump repair will be free, it is your responsibility to bring the pump back to your supplier. This means you will need to pay a plumber to call out and disconnect your pump and then after it is repaired, pay them again to reconnect your pump. Q: What do I do if I suspect there is a problem with the pump I bought from Dublin Plumbers Co-op? – A: If you suspect there is a problem with your pump, simply call us on 086 357 9495 and we will ask you some questions to try and discover if the pump is faulty or not. If the pump is faulty and it is within your warranty period, we will repair your pump free of charge. Q: If my pump should breakdown outside normal business hours or over the weekend, can you still send a repair technician out? – A: Yes. We provide a seven day a week warranty repair service at no extra cost to you. Simply call us on 086 357 9495 to book a warranty service call and we will let you know the next available call out slot. Generally speaking, we usually are able to send our pump repair technician to you on the same day you contact us. Q: If my pump is outside the 12 month warranty period and it breaks down, can you still repair it for me? – A: Yes, absolutely we can. However, there will be a repair charge as your warranty will have expired. We will of course look after you with the repair costs as you bought the pump from us. For more information on our fantastic reconditioned Stuart Turn positive head and negative head shower pump replacement offer, please call us 086 357 9495 seven days a week, 24 hours a day. Please read our terms and conditions for this pump replacement special offer.